Thin Blue Line Key Chain is a must-have for police officers and their supporters. The keychain is made of high-quality aluminum. 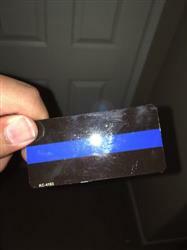 It is lightweight and durable, the perfect size to carry around and a great way to support law enforcement. Proudly made in the United States of America. The tin clangs with the keys on the keychain so I think I would have preferred if it was plastic instead of tin. perfect to show support for Police. Can also be used to open packages!